The 100-day countdown to Dacia’s UK launch and pre-launch activities has begun. 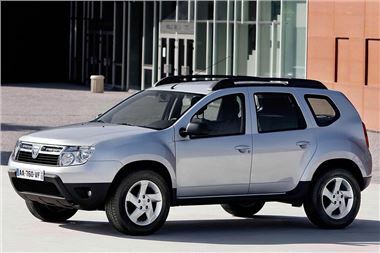 Further details of the Dacia Duster SUV, including price and range line-up, will be confirmed on 28th June 2012 with first deliveriesfrom January 2013. Two models will be offered: the Dacia Duster SUV and all-new Dacia Sandero supermini – both with a ‘Shockingly Affordable’ combination of price, space and equipment. Dacia will pioneer a new smart-buy concept for car buyers: by eliminating the cost of the unnecessary in its vehicles, it offers buyers exactly what they need, at incredibly attractive prices. Duster: a compact SUV for city car money: -The range will start from less than £10,000, with 4x4 versions available from less than £12,500, a staggering £6,000-£10,000 less than similar-sized cars from other manufacturers. Sandero - the all-new five-door supermini will instantly become one of the UK’s most affordable cars at launch, starting at less than £7,000. With household budgets being squeezed more than ever, value-for-money is fast becoming the holy grail. With its ‘smart-buy’ concept, Dacia is aiming to be the car brand of choice for new car buyers, offering exactly what they need at shockingly affordable prices. Dacia officially launches in UK showrooms in January 2013 with a twin offering of the Duster SUV and the all-new Sandero supermini. The first of the duo to arrive on British shores will be the multi award-winning Duster in late 2012. Set to wow buyers with chunky and unpretentious styling, impressive and versatile interior space, peerless build quality and unbeatable value-for-money, Dacia’s SUV will be seeking to emulate its phenomenal global sales success to date over here. The second-generation, all-new Sandero supermini will arrive in showrooms late 2012 ahead of official launch in January 2013. Again, mirroring the jaw-dropping pricing of its larger SUV sibling, offering a refreshing change to any other ‘value’ alternatives, the range will start from less than £7,000. Whilst official UK launch prices will be announced in June, Dacia is delighted to confirm that Duster, a compact SUV similar in size to the Nissan Qashqai, will start at less than £10,000 in 4x2 guise, with 4x4 versions from under £12,500. This means buyers can have all the space and style of an SUV at prices usually reserved for the smallest of superminis and city cars. Quite simply, no other car in the country will offer the same space, price and equipment for the money. Bought by Renault in 1999, Dacia (pronounced ‘Dat-ch-a’), re-emerged amidst a blaze of publicity in 2004 with the unveiling of the four-door Logan saloon. Created as the first new model under Renault Group ownership, it set about tapping into the potential of emerging markets, including Central Europe, with a jaw-dropping price of 5,000 euros in some countries. To those in the know, the positive Press reports and website forum comments which followed were largely predictable, but the sudden clamour for the brand from Western European markets certainly wasn’t. Eight years on, and with five more models under its belt, Dacia has been valiantly trying to keep up with surging global demand for its high-quality, reliable and affordable vehicles ever since. Due to the brand’s unprecedented global success in recent times, particularly the Duster SUV, Renault Group factories have been unable to provide right-hand-drive model production. Until now. By late 2012, right-hand-drive versions of Dacia’s SUV, built at the new Renault-Nissan Alliance factory in India, will start arriving in the UK, ready for deliveries from January 2013. Thanks to an unbeatable combination of price, space and equipment, Europe’s fastest growing automotive brand for the last six years has appealed to smart consumers in every country in which the brand is on sale, who have realised they can buy a car which easily meets their needs, without spending more than they need to. In Western Europe, thanks to a growing model line-up, with attractive design, ultra-affordable prices and solid reliability, Dacia has become an established player in just a few years. Last year, it claimed top spot in Romania and Morocco, and even became France’s fourth best-selling brand in 2010, with Duster becoming the best-selling 4x4 in the country. When it comes to reliability, Dacia really excels. Every model is extensively tested, primarily so that they can cope with the tough terrain and weather extremes in far-flung destinations, from Colombia to Iran or soon, even the Scottish Highlands. They also make extensive use of proven and honed technology from within the Renault-Nissan Alliance to ensure cars are built to stand the test of time, with impressive results: Dacia finished second, just behind Audi and ahead of BMW, in Germany’s 2010 J.D. Power Customer Satisfaction survey. Smart consumers eager to be the first to find out more in the lead-up to UK launch are invited to sign-up now at www.dacia.co.uk, where regular news updates will be posted in the coming months. Details of pre-launch activities will also be available on twitter @daciauk, www.facebook.com/daciauk or by calling 0800 99 11 99.